Ah I love this time of year – well certainly not for the winter weather, but it’s Tour de France time and of course Bastille Day. It was the perfect occasion to break out my lovely French linen, cook creme brûlée and to celebrate all things French. I hosted a dinner party which started with Edith Piaf’s greatest hits (cheesy but kind of cool), and I made my ‘famous amongst family and friends’ St Chinian Peasant Sausage Stew that was concocted by us and our friend Jo when we were in France in 2008. I’ll make that another time and blog about it, but in the meantime the recipe is on my travel blog if you’re keen to give it a go. 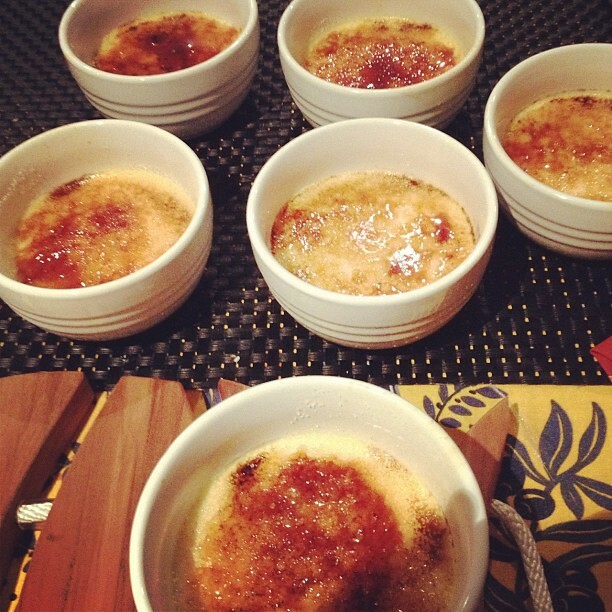 The earliest known reference to creme brûlée was in a French cookbook in the 15th century. In the early 18th century it was known as ‘burnt cream’ in English. It also uses the ‘bain marie’ cooking technique, which is kind of like cooking your custards in a water bath (highly scientific definition – not). Creme brûlée is deceptively easy to make and if you’re a bit of a pyromaniac like me, the fun bit is in blowtorching the sugar on top to make the hard caramel that has a distinctive ‘crack’ when you dig in! Extra sugar for caramelizing the top of the puddings. 2. Put cream in a saucepan and scrape the vanilla seeds into it. Chop the empty pod into small pieces and add to the saucepan. 3. Bring the cream to boiling point, then reduce the heat and simmer for 5 minutes. 4. In a heatproof bowl, beat the egg yolks and sugar together until pale and fluffy. Bring the cream back to boiling point, and pour it over the egg mixture, whisking continuously until beginning to thicken. 5. Strain the mixture through a fine sieve into a jug, then pour into ramekins until each one is 2/3rds full. 6. Place the ramekins in a large roasting dish, and fill the dish with hot water until it comes approx half way up the ramekins (this is the bain marie bit). 7. Place the roasting dish in the centre of the oven and cook for 40-45 minutes, or until the custards are set but still a bit wobbly in the middle. 8. 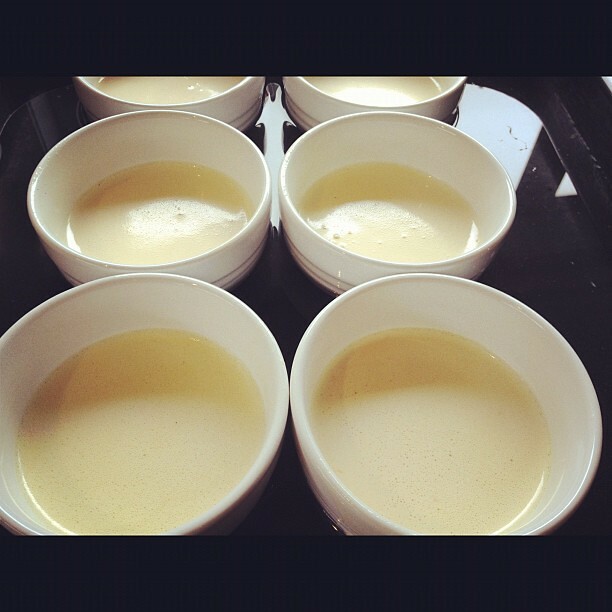 Remove the ramekins from the water and set aside to cool to room temperature. Chill if needed. 9. 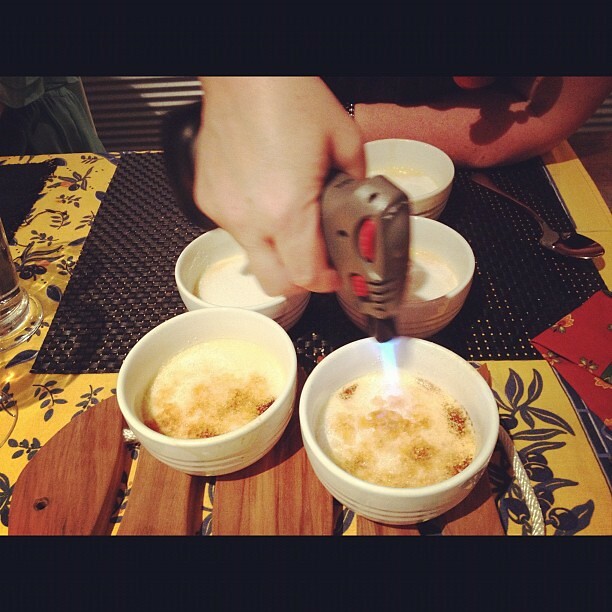 When ready to serve, sprinkle 1 tsp of sugar on top of the creme brûlée, and caramalise with a chef’s blowtorch. If you don’t have a blowtorch, you can just stick it under the grill for a couple of minutes.